New Bombay is a friggin’ good Indian restaurant. It’s been around for ages, but I only got to try it a few weeks ago. The food is authentically Indian, prices are very reasonable and servings just right. And the taste? Faaaantastic. My friends and I tried the branch at Dela Costa St., Salcedo Village. We knew we wanted curry, masala and not so much spice (as one of our companions was very sensitive to spicy food), but didn’t know what dishes would be best. Our server was very pleasant, helpfully recommended viands and indulged us in our questioning. We ended up ordering Shrimp Curry, Chicken Tikka Masala, Eggplant Barta, Samosa, Chapati, Naan, and Sweet Lassi all around. That was one of the best lunches ever. Yesterday my husband and I went to the branch at Wilson St. in San Juan. The place was more elaborate than the first place I had been to. It was much more spacious, having two floors, and each nook was decorated with distinctly Indian trinkets. We ordered Chicken Keema, then a mixed veggie dish whose name I have forgotten, Chicken Masala and Chicken Tikka Masala. Service was a lot slower than the Dela Costa branch, but the food was still as flavorful. The vegetable dish was a surprise to me — it was a mix of different veggies and cottage cheese. Yowza! Reading it off the menu, I was a bit apprehensive. But good thing my husband ordered it because it turned out to be really delicious. The two orders of Masala were a mess-up by our server. Ah well. I won’t go into detail on that. The ending is that I got the right order in the end, but still had to pay for the mess-up. Oh well. Are we going back? Definitely! I’m taking my husband to the Dela Costa branch next. Even though the space is a lot smaller than the Wilson one, I like how more informal the atmosphere is and how the service is much friendlier. The food tastes just as fantastic anyway. Till my next visit my dreams will be all Chicken Tikka Masala. Mmmmm. The resto and the food you had all seem great, but how affordable are they? Is New Bombay pricey? 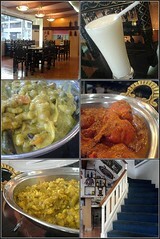 If you really want to compare Indian restos in Makati, try Swagat in Rada and ofcourse Bollywood in GB3. We used to live a block away from the Dela Costa branch and loved having dinner there! The pictures of the Wilson Street branch look nice but you’re right Toni, the Dela Costa branch is so informal that you can’t help but feel right at home. Miriam, in 2003-2005 they were located about two blocks away from the corner of Makati Avenue and Dela Costa, facing a Salon de Manila and a Ministop. Not sure if all those establishments are still in the same places now.